The window-less front and Water Avenue side of the Eagles Building at 127 Broadalbin Street N.W. Albany’s urban renewal agency has received word of an offer by the Albany Eagles to sell the city their lodge, a property shown in a city plan as a key site to provide more downtown parking. The Central Albany Revitalization Area advisory board heard about the offer Wednesday from Ed Hodney, the parks and recreation director who now handles urban renewal as well. Hodney said the lodge had authorized that the offer be disclosed at a public meeting, but it still needed approval of a higher level in the organization. An asking price of $675,000 was mentioned. 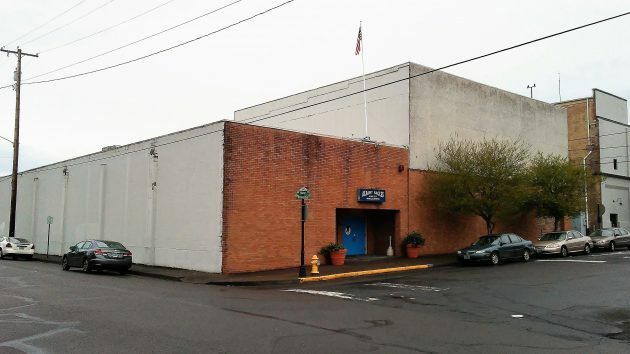 The building sits on the southeast corner of Water Avenue and Broadalbin Street. It is designated as a possible site for a parking structure in the Central Albany Retail Refinement Plan. When the plan came out in the fall of 2011, the Eagles said they were not interested in selling, and CARA did not pursue the idea. The 2011 plan designated the properties fronting on Water Avenue east and west of Broadalbin Street as parking sites, to be developed in phases. “The initial phase would increase the available surface parking and a second phase would include a four-level (three story) parking structure with active groundfloor uses along Broadalbin Street and Water Avenue,” the plan said. The four levels would have parking for 346 cars, including 104 on the roof. The plan also envisioned a big commercial anchor on Water between the Willamette River bridges, and more retail space along First and Water avenues. Whether any of that ever happens is open to doubt. But even without added retail space downtown, parking has become an issue with the scheduled opening this summer of the Albany Carousel, which expects to have lots of visitors. 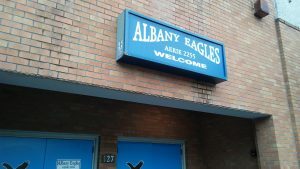 The Albany “aerie” of the Fraternal Order of Eagles is not taxable. But on the Linn County assessor’s rolls, two properties are shown under the Eagles’ ownership at the same address. One part was built in 1950, the other in 1968, according to the county. Together they are said to have a “real market value” of $952,520. 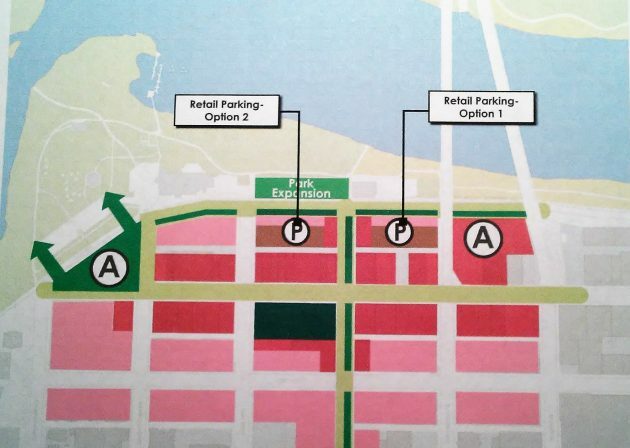 An image from the 2011 Retail Refinement Plan. Like the old Shopping Mall with two large magnet stores at either end, our City Moms and Pops could buy up the Eagles Aerie, bulldoze it, salt the ground it once sat upon, and then proceed to build an old-fashioned roller-coaster to complement the Merry Go Round. One of those old wooden roller coasters, with a funky paint job. Imagine how downtown Albany, once the I-5 Bummer, berated by the governor as an eyesore, is now become an entertainment colossus, (with a small c). There could be a Marching Band of 76 Trombones as well. A giant ferris wheel would be a much better option. Fun for a much wider age range. Roller coasters and zip lines trend towards a much younger demo. The above comments by a couple of City councilors just goes to show their facetious & callous contempt they have for us taxpayers in using CARA money. “What the heck, we got it easy & easy we’ll gladly spend it…” must be their mantra!